Modern equipment is used to help us maintain such a high volume of productivity while preserving consistency and quality. Jorge Alfonso started baking croissants in 1959 and became the Pastry Chef at the elite department store in San Francisco, The City of Paris. After the stores closing in 1972, Jorge purchased a retail bakery shop and continued to make croissants for the San Francisco area. During this time he was selling over 500 croissants per day. 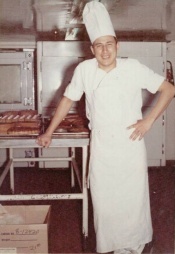 Jorge Alfonso decided to focus on wholesale and purchased Oven Fresh Bakery in 1975. He immediately expanded the product line, which included a variety of Danish and Croissant products. After outgrowing the facility, he purchased a new facility in Redwood City in 1986. We moved to our new Hayward facility in 2015. Over the years, Oven Fresh Bakery has kept up with increased production volume by purchasing equipment with advanced technology. This equipment helps us maintain such a high volume of productivity while preserving consistency and quality. Today Oven Fresh Bakery continues as a third generation family business and produces over 50,000 croissants per day in addition to our other pastry products. We keep the tradition of using only quality ingredients and providing excellent service to our customers. We do not believe in cutting corners when it comes to the labor involved in making our products. Producing our Croissant and Danish doughs is very labor intensive. Our lamination process consists of many layers which produce a light and flaky texture. You and your customers will be sure to notice the superb quality. Oven Fresh Bakery's lamination process produces flaky-texture croissants that consumers love! There are the five types of zero grams trans fat croissants to choose from. All of Oven Fresh Bakery's products come with complete baking instructions making it easy for you to prepare and serve fresh and delicious pastries to your customers. Contact Oven Fresh Bakery with any questions about our products and facility. © 2009 Oven Fresh Bakery, Inc.